9.How are photo resists exposed, and how can the optimum exposure dose be determined? How long can coated and exposed substrates be stored prior to exposure? The exposure is performed using masks in suitable exposure systems such as e.g. steppers (i-, g-line), mask aligners or contact exposure systems in the appropriate spectral working range. 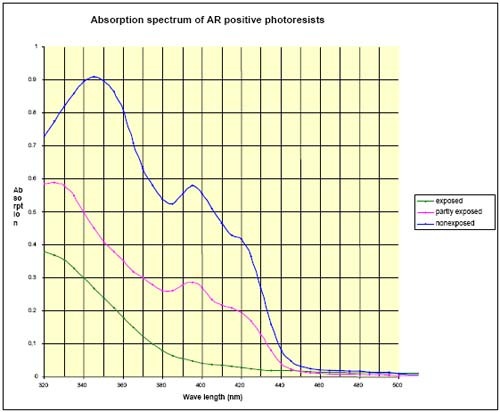 AR photo coatings are sensitive in the broad band UV range (300~450nm) and thus also to the typical emission lines of mercury at 365nm (i-line), 405nm (h-line), and 436nm (g-line) (→Spectrum), with maximum sensitivity in the g-line- and the h-line range. Using resists with special features (e.g. 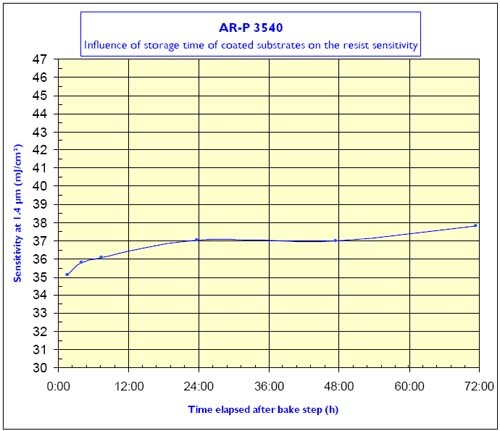 SX AR-P 3500/6), exposure may under certain circumstances also be carried out at 488 nm (argon ion gas laser) or even at 532 nm (Neodym-YAG laser). For the UV range between 248~265 nm, resists AR-P 5800 and AR-N 4300 are particularly suited. Values for the light sensitivity as indicated in our product information are only guideline values which we determined in our standard assays. But every user employs different procedures and therefore has to determine the optimum exposure dose in own tests. For positive resists, the exposure dose (dose to clear) which is required to develop a large area without structures in a suitable development time (depending on the film thickness, for 1~2 μm approximately 30~40 s) should be increased by 10~20% for structural imaging. For negative resists, the time for complete development of unexposed areas of 1~2 μm is also about 30~40 s. The exposure dose which produces a film of > 90 % of Do should similarly be increased by 10~20 % for patterning. Coated and baked resist films can be stored for several weeks prior to exposure without quality loss. The photoresists are more sensitive directly after the coating step as compared to coated films which were stored for several hours or days. The decrease in sensitivity is approximately 3 % after 3 h, approximately 6 % after 72 h, and 8 % after 72 hours (as compared to the initial value).